No. 35 Balmoral Place turns its back to the street. It was built to face the river, which was the highway of the 1860s. People used sleighs in winter, boats in summer. James Spence, who built it, was brought to the Red River Settlement in 1815 as a little boy. He married in 1841, bought 10 chains river frontage. (That's a surveyor's measure for 66 feet, the width of most city streets now) . First, Mr. Spence built a log house; later he built this house. When his daughter Mary married James Lang he gave them part of his river lot for a wedding present. They went to live in a log building still standing on Portage Avenue, just east of United College. Their son Samuel Lang was born there in 1874; today he lives at 507 Walker Avenue. Yes, there are people living in Winnipeg who were born in log houses. Next time you walk from the Hudson's Bay store to United College, think of the two families whose names now make Spence Street and Langside Street. The Lang house became a stopping place, or hotel, on the Portage trail, the road the settlers took to go west. When they got as far as Omand's Creek, where the subway is now, they had to be careful their goods didn't fall off their wagons. John Omand, who built a log house in 1857 where Raglan Road is now, used to guide them over safely. 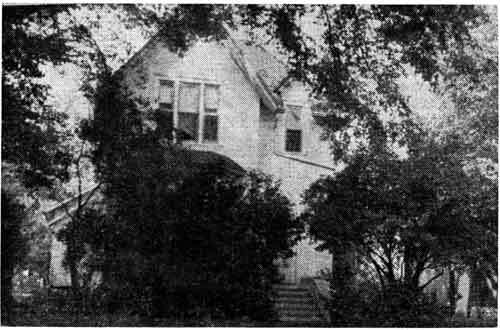 The log house is gone, but the house he built for his son John in the early 1880s, now numbered 1403 Portage Avenue, still stands. In winter it's a wonderful sliding place for children, yet the settlers found it dangerous.